A complete series of packing list envelopes and other enclosures for placement on the outside of packages and precautionary and informational labels to caution package handers and other parties about the properties of the packages. Packing list envelopes are used in virtually all industries for a multitude of applications when there’s a need to protect printed materials from moisture, dirt and dust, and attach these documents to the outside of packages. The documents can include packing lists, invoices, Material Safety Data Sheets, manuals, warranties and other printed materials. It’s best to use packing list envelopes with full adhesive backing for complete protection, as are the envelopes we supply. Some other envelopes have empty spaces in the adhesive seal, which can allow moisture or dirt to enter the envelope. Precautionary labels should be used to comply with OSHA regulations and as protection against damage for special product shipments, like specialty chemicals. The most common cause of failure with packing list envelopes is when the envelopes are too full or thick. This over-packing causes the edges to lift, so that the envelopes could be torn from the packages when they rub up against other packages during shipment. To assure that too much material is not placed in envelopes, many sizes of envelopes are available. Special care must be taken when affixing precautionary labels to cartons; you should be careful that the surface is dry, clean and flat to promote adherence. Packing list envelopes are available in 68 sizes, both in printed and unprinted versions. Custom sizes and prints are available to meet special requirements. 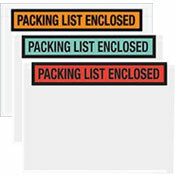 Packing list envelopes are manufactured from polyethylene with an acrylic adhesive backing usable in a wide range of temperatures. The envelope face and the white backings are both .002 inches thick. 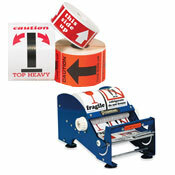 Precautionary labels are available in more than 150 varieties, including various colors and sizes. Custom sizes and die cuts are available. The labels are generally made of paper with permanent adhesives, but specialized materials can also be used.